Can I Have a Puppy When I Work Fulltime? This is something I get asked frequently. Sadly, it is not unusual for dog welfare to be compromised in homes where everyone works. But this does not need to be the case, if proper arrangements are put in place, with provision made for emergencies. Raising a puppy while working full time can be done, but you need to do it right. There are some critical questions that you need to consider and plan for before they happen. The most critical question is – do you have a good support network to support you and your puppy – particularly in the early months? What do you do with your puppy while you are out? How is he going to be house-trained if you are not there? How do you stop him chewing stuff he shouldn’t? What if he starts howling or barking while you are out and the neighbours complain? During the day, most 8-10-week-old puppies have a tiny bladder capacity that can hold around an hour’s urine. Maximum! And some puppies will last not much more than twenty minutes at certain times of the day during the first week or so. This means it is not possible to leave a brand-new puppy in a crate for longer than an hour at most (during the day) without risking accidents. Puppies do not like wetting their bed and generally will attempt not to. Does it matter if a puppy does wets his bed? Yes, it does matter, because once a puppy has wet his bed a few times, he’ll stop minding. He’ll also stop trying to hold on for a bit longer. This may make house training a longer process and potentially create a long-term bed wetting problem. So, where is the best place for your puppy to be while you are at work? Nor can you give him the run of the house as he’ll pee and poop everywhere, and chew things he shouldn’t. You need to puppy-proof a safe room for him; or provide him with a playpen. Many people leave their puppy in the kitchen as this usually has a washable floor. However, some puppies will chew the skirting boards, the fridge cable, the kitchen towel etc. Puppy pens are, in my opinion, one of the best ways to keep your puppy (and your house safe). The pen needs to be study, and large enough for your puppy to stretch his legs, and empty his bowels and bladder away from his sleeping area. This helps to preserve his natural instincts to keep his den clean. Later, your whole home will be his den, so we want to keep this instinct nice and strong. 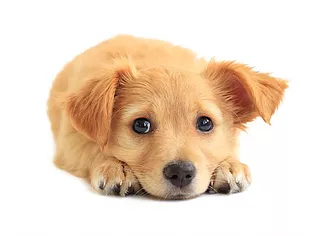 Puppies need help with toilet training and socialisation, and will become very distressed if isolated for long periods of time in a strange place. Lonely puppies will often howl and bark. To prevent potential future problems, it is very important that a puppy is introduced to solitude in a slow and very gradual manner, and after he has settled in to his new home. The answer is to limit the time your puppy spends on his own to a reasonable and appropriate amount for his age. And to provide him with entertainment. This means you will need to arrange for someone to be there for when you can’t be during the early months of your puppy’s life. This is both, to establish good toileting habits, and to introduce him to the concept of learning to be alone for longer periods. So, how long can a puppy be left alone? Here are some guidelines to help you figure out what kind of help you are going to need at each stage. Your new puppy needs a lot of attention and companionship. For the first few days your home is a stranger’s home. And he may be very upset to be left alone there. You need to either arrange for time off work to be with him for most of the day, or for someone else to look after him whilst you are at work. He needs to be taken out to his toilet area at very frequent intervals, and gradually accustomed to spending longer periods of time alone. Your puppy’s bladder capacity is increasing but he may still be unable to last the four hours until you come home at lunch time. If you crate him, you’ll need to arrange for someone to come in and let him out mid-morning. Or the equivalent for an afternoon or evening shift. If you leave him alone for four hours, you’ll need a puppy pen to keep him safe and out of mischief. With his night crate at one end with the door open, so that he can empty his bladder away from his sleeping quarters. By the time he is six months old, your puppy will probably be able to last three to four hours without a wee, and he may be happy to sleep those four hours away in a large adult sized crate. It is important here to consider the journey time to and from work. People often say, “I only work four hours” but in reality, the dog is left a good deal longer than that because of the travel time If you are going to leave your dog any more than four hours, then he really would be better off with a puppy pen arrangement with plenty of entertainment to keep him amused and out of trouble. These are broad guidelines of course, and every dog is different. So can you have a puppy and still work full-time? The answer is yes with thought, effort and sometimes considerable expense.